This user-friendly resource includes simple explanations of grammar, punctuation, and usage; scores of helpful examples; dozens of reproducible worksheets; and pre- and post-tests to help teach grammar to students of all ages. Appropriate for virtually any age range, this authoritative guide makes learning English grammar and usage simple and fun. This updated Eleventh Edition reflects the latest updates to English usage and grammar and features a fully revised two-color design and lay-flat binding for easy photocopying. 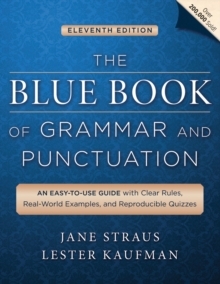 * Clear and concise, easy-to-follow, offering "just the facts" * Fully updated to reflect the latest rules in grammar and usage along with new quizzes * Ideal for students from seventh grade through adulthood in the US and abroad For anyone who wants to understand the major rules and subtle guidelines of English grammar and usage, The Blue Book of Grammar and Punctuation offers comprehensive, straightforward instruction.